Attention all the ITI degree holders! If you have completed your ITI degree and now the search for a good job, then Chekrs will help you in doing so. You are welcomed at one stop for all job seekers giving you the refined ITI Vacancies 2019 that you have been looking for. Other than the government sector there are no limitations in the private sector as you can know hundreds of ITI Private Jobs in Delhi, Bangalore, Hyderabad, etc big cities. Whether you are experienced or looking as Jobs for ITI Freshers there are uncountable options for you. If you are interested in receiving the job updates that let you know all the latest and upcoming jobs than Chekrs is just the right spot. You are exposed to infinite ITI Private Jobs options coming from different institutions such as Banks, Educational groups, MNCs, etc. To catch up all the ITI Latest Job 2019 and the Upcoming ITI Govt Job notifications you have to do is subscribe the services offered by jobs.chekrs.com. 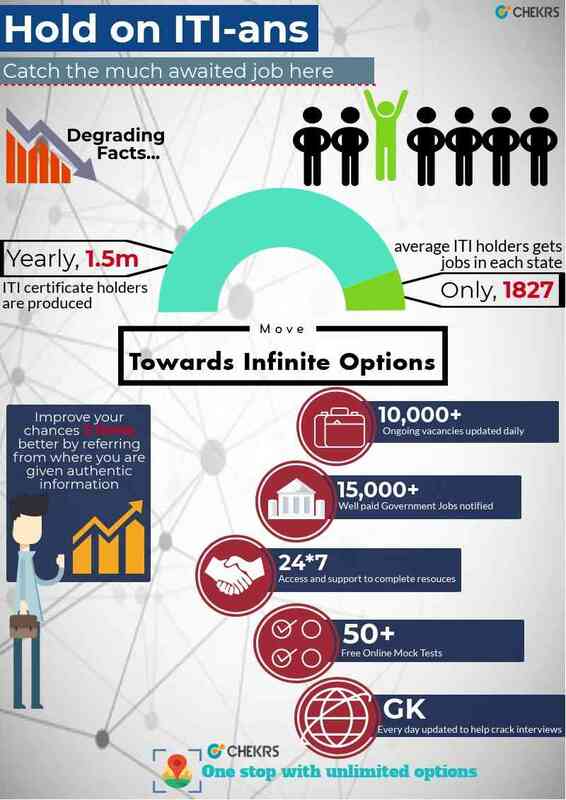 Why Chekrs for Jobs ITI Recruitment 2019? Other than knowing the vacancies, selection in them is more important. To help you succeed in the complete process and getting a job. You can check out the details of the job requirement, its eligibility criteria, selection process and how you can apply for them. To facilitate good performance you are provided the study material comprising of papers and online tests.